Our Juniors program, designed for students 6 to 10 years old, serves as the next step in their martial arts training. 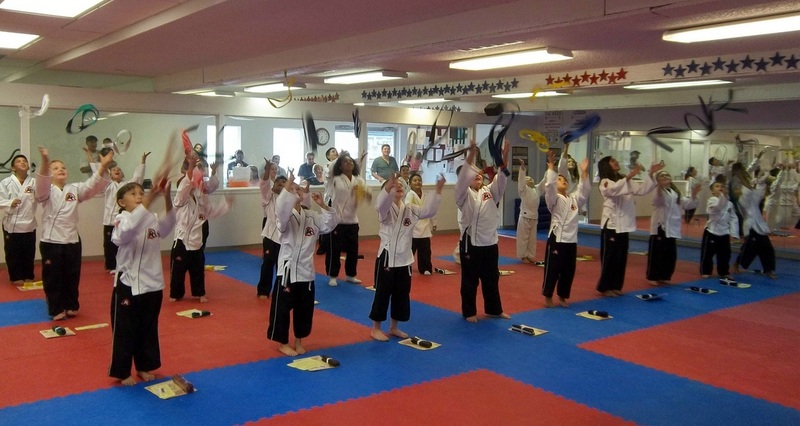 These lessons develop self-esteem and confidence, teach discipline and self-control, help channel energy, develop lifelong self defense skills, and encourages positive work ethic and academic values. One of the most critical components of a child’s success is confidence. Without it, they may limit themselves by either not taking on new challenges at all or by not giving 100 percent in the activities they do try because they do not think that they will be successful. As they get older, a low self esteem makes them more vulnerable to peer pressure. A child with a low self esteem is desperate for peer acceptance and may be more likely to go along with bad ideas than a child who has a strong self image. The positive learning atmosphere of our classes and the progression through our rank system build confidence and help reinforce a strong self image. Our Juniors and Youth have plenty of energy. Our classes give them an outlet for releasing that energy in a positive way. Our Junior students are growing up in the digital age with excessive screen time (television, computers, cell phones, and video games) and fast food. Kids no longer play outside after school until it is dark and their parents call them to come inside. All too often they have been inside all along logging in more screen time. We get them unplugged and give them a complete workout that they enjoy doing. Our Junior an Youth students will not receive the benefits of the program at home on the couch. We make the classes fun and exciting so that they want to come to the next class with their friends at TaeKwonDo.